Brush corn with 2 tablespoons of olive oil. Place corn on the preheated grill. Cook, turning occasionally, 10 minutes, or until tender. 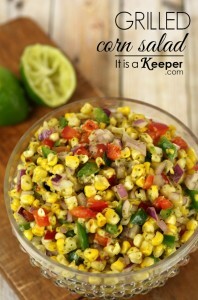 Cut the corn kernels from the cob, and place in a medium bowl. Add the peppers and onions to the corn. In a blender or food processor, mix the cilantro, olive oil, garlic, lime juice, sugar, salt and pepper. Blend until smooth. Stir dressing into the corn salad.